If you want to know some information from yellow pages directory then it could be easily done by the help of Yellow Leads Extractor, a powerful Yellow Pages Scraper for USA, Canada, French, German, Italy, Spain, Switzerland, etc. 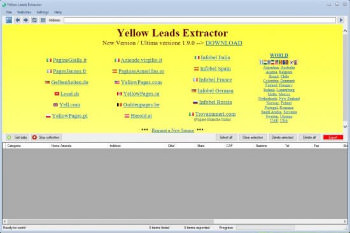 Now Y-Leads Extractor supports also Yelp, and it is one of the best YELP DATA SCRAPER on the market Basically it is a tool that searches popular yellow pages directories and provides you all information such as businesses name, address, phone numbers as well as emails. You can save the extracted information in CSV format or in your Microsoft Excel. Therefore, just use this reliable tool and get all information which you want from a yellow pages. In addition to the yellow pages directory, the program allows you to capture company data from around the world thanks to the Infobel directory.